I'm still a fan of Tom Cruise, the movie star, and I think many people are they just tend to be weary of the guy for reasons having to do with things we don't really know much about and/or have probably been warped in the public eye, but be he as weird as Scientology has made him out to be or not...the guy is still a movie star; one of our last genuine movie stars and he's damn good at what he does. While I always enjoy seeing Cruise perform insane stunts and place himself at the helm of Mission: Impossible movies while also lending his name and commitment level to would-be franchises such as this weekend's The Mummy, I miss Tom Cruise: dramatic actor. It has been five years since we've seen Cruise in something other than a balls to the wall actioner (Rock of Ages) and almost a decade since we've seen him in something inherently dramatic (Valkyrie). And so, it is with much happiness and a renewed sense of optimism that I look forward to the next Tom Cruise drama that, while it does seem to include a fair amount of action, is more a grounded crime thriller than anything else. Re-teaming with Edge of Tomorrow director Doug Liman (The Bourne Identity, Mr. & Mrs. Smith) American Made comes from screenwriter Gary Spinelli and is based on the true story of a pilot who landed a job for the CIA and as a drug runner in the south during the 1980's. The first clip from the film makes this look like a really fascinating time at the movies and I can't tell if that's just because I'm excited to see Cruise play something of a more traditional everyman or if it's genuinely because the movie looks good. The final product will hopefully prove to be solid thanks to a little bit of both, but we'll see. Fans of Top Gun will surely get a little kick of nostalgia before the so-called sequel actually goes into production given this clip features Cruise flying around and getting into trouble, but more than this the film looks to be in very much the same vein as The Wolf of Wall Street (the song in the beginning of the trailer is very reminiscent of "Black Skinhead"), Lord of War, or even last years War Dogs and given I thoroughly enjoyed each of those I'm excited to see what Liman and Cruise bring to the table. Also, Domhnall Gleeson looks fantastic in this. American Made also stars Sarah Wright, E. Roger Mitchell, Jesse Plemons, Lola Kirke, Alejandro Edda, Benito Martinez, Caleb Landry Jones, Jayma Mays, and opens on September 29th, 2017. 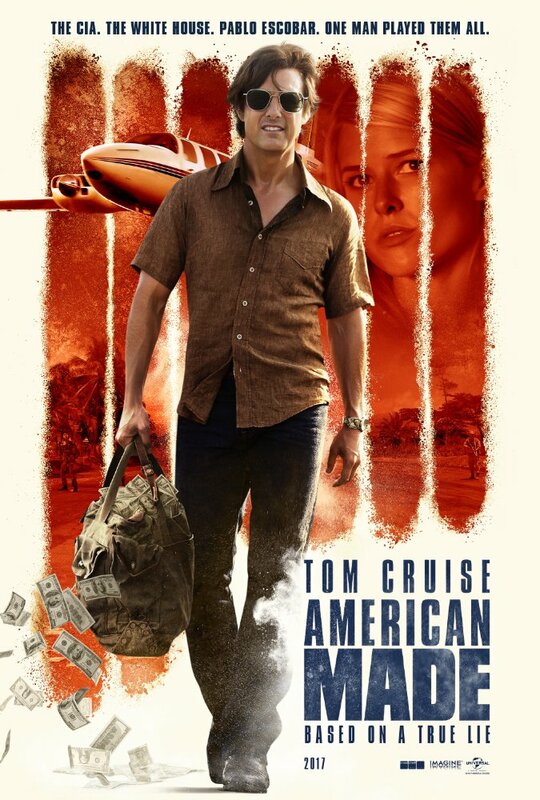 Synopsis: In Universal Pictures’ American Made, Tom Cruise reunites with his Edge of Tomorrow director, Doug Liman (The Bourne Identity, Mr. and Mrs. Smith), in this international escapade based on the outrageous (and real) exploits of a hustler and pilot unexpectedly recruited by the CIA to run one of the biggest covert operations in U.S. history.